Bao Down‘s Gastown location has been around for a while, but they also opened up their Gastro Bar and Pub in Olympic Village earlier this year. S and I decided to check it out for dinner. The interior is quite casual with a cool modern vibe and colourful painting on the wall. On one side, they also have a bar. We started off with the Fraser Valley Huli Huli Chicken which came with a chicken thigh and breast in a Hawaiian marinade, topped with a cane vinegar glaze, tamari, and a side of asian slaw and garlic fried rice. The chicken was tender with just the right flavour, but the cane vinegar glze was way too acidic. It tasted as if they put too much vinegar and didn’t taste the sauce. This made the asian slaw extremely acidic and it also seeped to the bottom of the garlic fried rice. The garlic fried rice at the top tasted pretty good though with the garlic flavour extremely strong. Onto the extremely long named Chicken Wings which we chose the crispy garlic & fish sauce caramel flavour. There is also Thai spicy or salt and pepper. S can take really salty food but this had to be the saltiest thing we’ve ever ate! They literally dumped fish sauce onto the chicken wings… It was pretty much inedible. After we posted about this on Instagram, the owner told us that they had received a different brand of fish sauce from the supplier. However, I would think that the chefs still taste the sauce they make before they put it on the dish. Just didn’t make sense to us. I have to say, their batter is really crispy though. What a shame that the sauce ruined everything. Onto what Bao Down was first made famous for: their baos. we tried the Bao Chicka Bao Bao which came with garlic and lemongrass fried chicken, daikon, carrot, crisp garlic, fish sauce glaze and garlic mayo. These were my favourite of the night with the chicken having a beautiful batter and the sauces not being overbearing. The bao itself was light and fluffy. I highly suggest sticking to their baos, but you will only find a select few of their baos at this location. For dessert, I suggested to try their Halo Halo, which came with evaporated milk, banana roll, red beans, young coconut, coconut jelly, palm nuts, and purple yam ice cream. This again, was a huge mess. The dessert was huge for the price we paid, but their shaved ice was not shaved ice. It felt like they had a huge block of ice and just mashed it up so the pieces of ice were large, jagged and sharp. I don’t expect a snow like powder ice, but I would expect at least a simple shaved ice machine type of ice. This ruined the texture of the dessert as the pieces were too large. In addition, the food took forever to come. We waited for more than 40 minutes to get our food after ordering and the restaurant wasn’t even fully occupied. We were told by the owner later after our complaints that their deep fryer had broke so only one was available. Still, I would’ve appreciated the server letting us know why, but we barely got any service. Because we were extremely upset with our experience, the owner later contacted us on Instagram to invite us back for a free meal. We notified him the date and time we would arrive of which he confirmed, but when we arrived for brunch that day, the servers were not aware of this arrangement. In fact, no table was set aside for us. Luckily, there were two spots at the bar, so we took the seats. I mean, imagine if the place was full? Would we have to wait or come back another time? The owner was also not there, which I was surprised, but even if he was busy, I would’ve expected him to communicate to the staff about our arrival. It felt very unprofessional. Anyways, enough of the talk about service. As we chose to come on a weekend at lunch, they served the brunch menu, so the menu items were quite different. S got the Loco Moco which came with steamed rice topped with a hamburger patty, poached egg and mushroom gravy. The sauce had an Asian flavour, but we found that it lacked depth in flavour. It was okay. For myself, I had the Fried Chicken and Waffles. Some of the fried chicken pieces were moist while the others were extremely dry. The dry pieces were the small ones of course, so they should have controlled the cooking by taking out the smaller pieces first. I also found the seasoning to be too salty again for my liking. I feel like their food is quite salty overall. The Banger Bao was a surprise and I quite enjoyed it. It tasted just like a Egg McMuffin! It was filled with a sausage patty, scrambled egg, and processed cheese. Overall, we were quite disappointed with the food at Bao Down Gastro Bar and Pub. Even after giving them a second try, we can’t say that we have changed our opinion on the execution of the food. However, the baos are the stars here so I would revisit at their Gastown location for the baos. Price-wise, they are quite expensive based on what I get. If the food was better, I wouldn’t mind paying a higher price. However, with the unprofessional service and average food, I feel like I have other restaurant options to satisfy me. They are opening another location in Gastown and San Francisco, so they must be doing something right. Perhaps their food is just not the right taste for us? NOTE: All food were complimentary during brunch on our second visit. Stir-fried vermicelli and egg noodles, diced chicken and pork, and assorted vegetables. 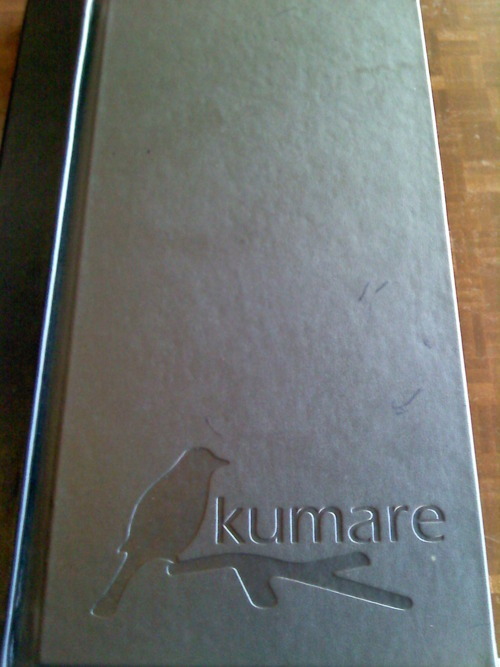 This is my second time at Kumare now! First time, I have to admit that I had no idea what I was ordering and wasn’t ordering the right “Filipino” food, so this time, I brought a Filipino friend with me for lunch! 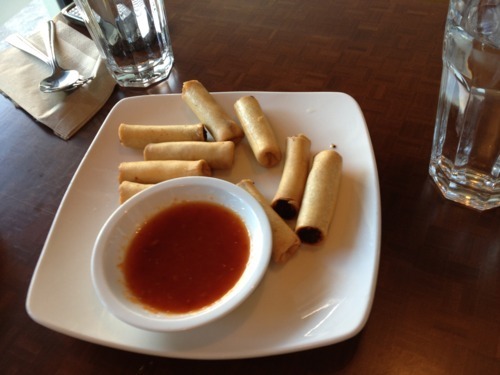 First off, we got some spring rolls that were filled with pork. They were really good and the filling was quite different from the ones I normally eat. 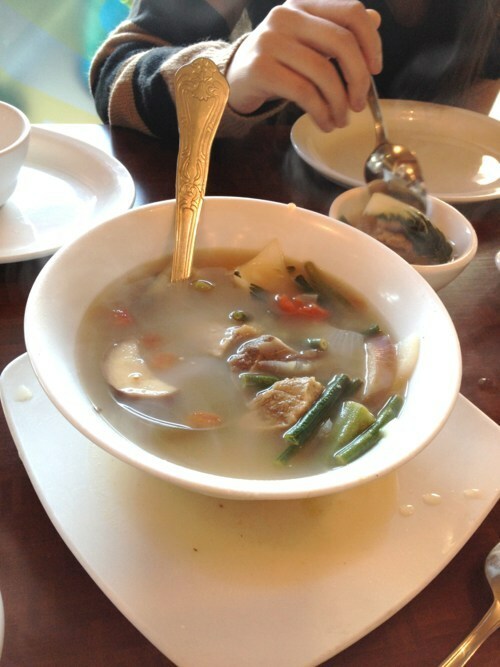 Then, there was the soup, which I found quite interesting. It had a lot of vegetables and it had a sour taste to it. Not something I would normally order, but it wasn’t too bad. 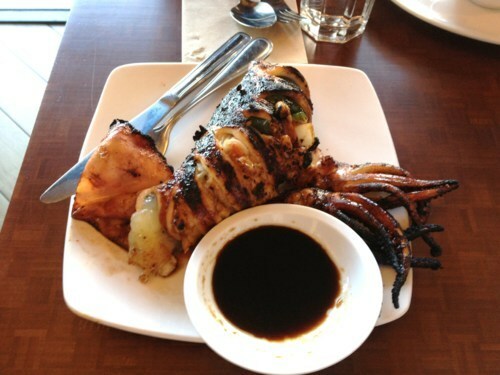 The squid was really interesting, as it was filled with green and red peppers, and then it was grilled. I have never tried something like this before! It was delicious other than the parts that were grilled a little too much. Those parts had a burnt taste to it. This time, my friend ordered noodles that were supposed to be Filipino – not those Pad Thai noodles I ordered last time that clearly were originated from the Malaysian and Thai Cuisine. The noodles were like vermicelli and had an interesting flavour to it. Quite delicious! 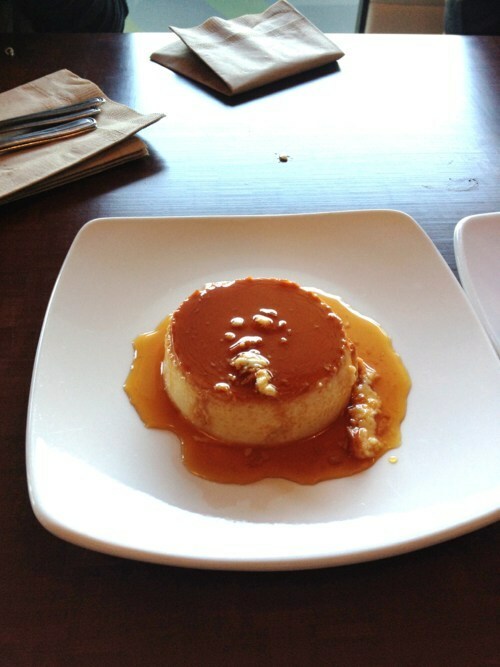 And last but not least, I finally got to try their desserts, since Kumare also has a bakery section to the restaurant. I insisted on trying the Taro Chiffon Cake as I wanted to for the longest time, but my friend also suggested the Leche Flan, which is basically like a caramel pudding. So glad she ordered that because it was so delicious! Definitely one of my favourite desserts now! 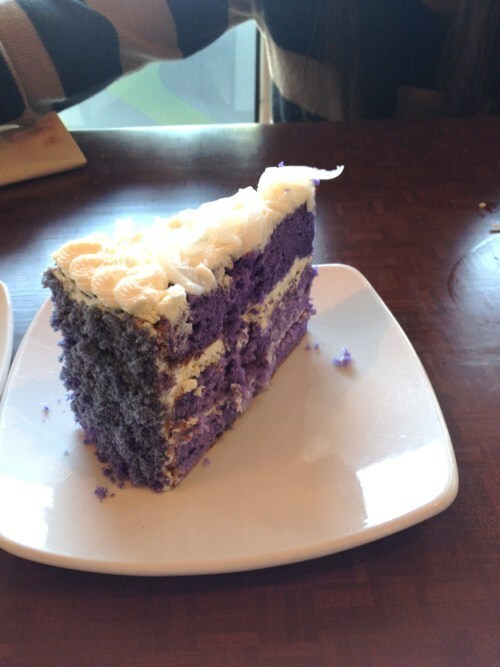 The Taro Cake was also not bad, as it had a nice taro flavour to it and the cream wasn’t too thick. It was also topped with some coconut that seemed to be freshly peeled off! Overall, it was a great experience having Filipino food. I think I might have a better idea of what to order next time and I’m definitely coming back! So I discovered Kumare on another food blog and was really interested as it was close by home but I had never seen this restaurant. 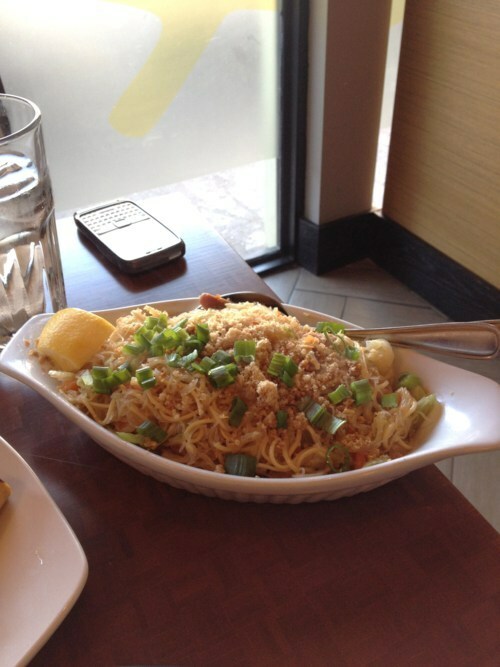 I also learned it served Philippine cuisine and I had never had it before, so I decided to try it out. It is located in Richmond, near Richmond Centre on Park Road. I believe this is an authentic Filipino restaurant as every diner in there seemed to be Filipino. We opened the menu and seriously had no idea what to order. 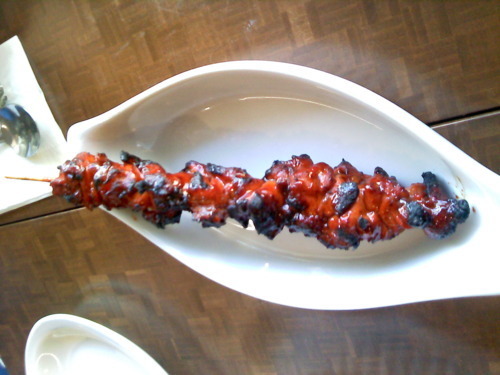 Maybe we should’ve asked for some recommendations, but we looked over and saw other diners with skewers so we decided to try them too. They were really delicious and I am going to get them for sure again when I go back. 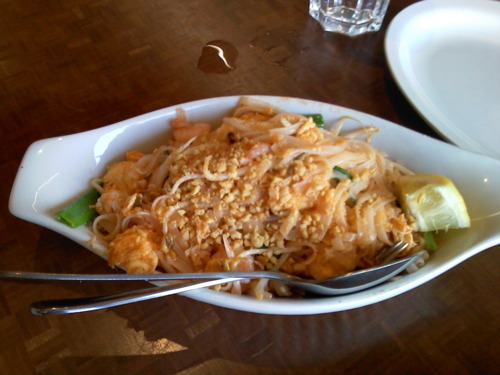 The Pad Thai was surprisingly not as flavourful as the ones I’ve had at Thai and Malaysian restaurants. I’m guessing most people don’t order that dish at Filipino restaurants. 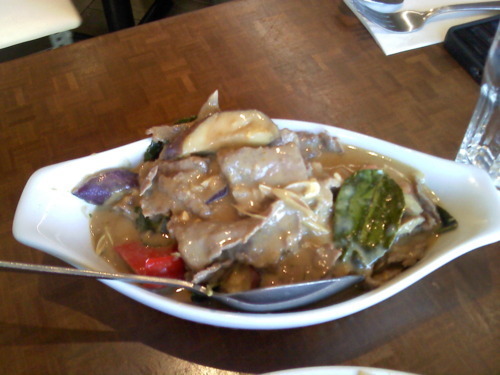 I found the Beef on Green Curry a little too salty, but it went well with a bowl of rice. It seemed that most people ordered a lot of dishes and had it accompanied with rice. I asked my Filipino friend the next day, and she told me that was usually the way it was eaten. Quite the same as the Chinese cuisine I guess. Overall, it was a very interesting experience and I think I might go there again. I would love to try their Ube Ice Cream or Chiffon Cake, which is taro flavoured. Apparently, it is their famous dessert!